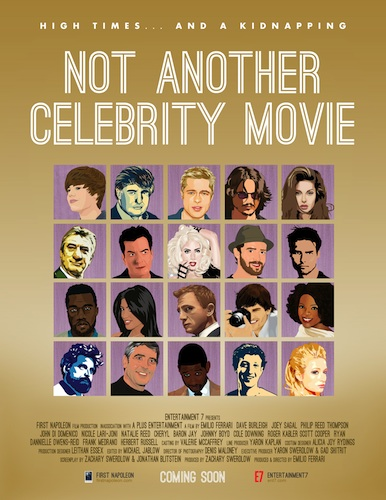 A whole movie made up of impersonators of real actors. They made a movie about people pretending to be famous actors. It’s worth watching the trailer to see the celebrity look-alikes. The trailer is funny and tacky at the same time. It’s Scary Movie (2000) meets Not Another Teen Movie (2001). The movie will probably not be any good. What do you think? Posted on March 6, 2013, in Previews of Upcoming Movies and tagged 007, Angelina Jolie, Ashton Kutcher, Brad Pitt, Charlie Sheen, Donald Trump, George Clooney, Johnny Depp, Justin Bieber, Kanye West, Kim Kardashian, Lady Gaga, Mark Zuckerberg, Not Another Teen Movie (2001), Oprah, Paris Hilton, Robert De Niro, Scary Movie (2000), Tom Cruise, Trailer for Not Another Celebrity Movie (2013), Usher, Zach Galifianakis. Bookmark the permalink. Leave a comment.